Every time Fish somewhere I am filling up a supermarket plastic bag with other Fishos rubbish, total disgrace. 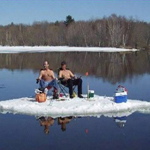 How did you go fishing, did you land anything and how was the conditions? Why are people such slobs. I carried out about 5 years' worth of bottle tops and broken glass shards from local freshwater fishing spots on the Yarra last year. I don't get it either. Not wanting to start another thread went for a walk today in the wind to scope out a potential location to target EP's now I know perch fishos tend to be pretty secrative but leaving the packaging for a Deruzze 55f and some ZMAN jigheads gives it away. Being second or 100th plus to this area doesn't **** me off but knowing that the idiot with the Hobie on the roof racks of his red wagon that was there for a few hours the day before could walk in with the yak but not clean up does.